I’ve been fortunate to instruct and work with many people that are beginning to code through the very same bootcamp I attended about a year and a half ago (Thinkful — yes this is a shameless plug 😜 ). Most recently I’ve been doing a series of workshops on Chrome Devtools, where I teach common parts of Chrome DevTools that many front end developers are using daily. One of the most common inefficiencies I’ve noticed is using console.log to preview JSON responses from an API. I didn't learn how to use Chrome DevTools until I got on my first gig. I knew how to do the basics — preview CSS changes, change HTML, basically a bit of the stuff inside the Elements tab. I've also heard similar stories from some of my colleagues at my current job — debugging & developer tools aren't usually learned until after people get out on their first gig. One reason is that 3–6 months is a short time to learn how to program, much less learn how to use developer tools well (but I digress…maybe that’s another blog post). 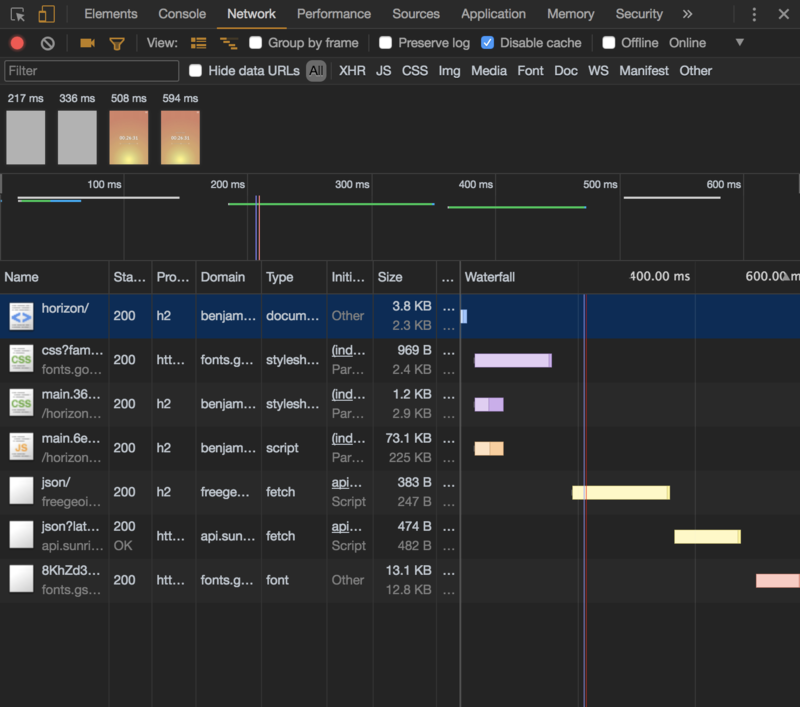 My most recent workshop focused on the Chrome DevTools "Network" tab: how to analyze your load time & other "productivity hacks" I've picked up. One of the earlier lessons in the process of learning web development is learning about fetching data via AJAX. Most apps that goes beyond triviality or need to respond to data dynamically are gonna fetch some JSON from an API, and then operate on that JSON. Many times, I would find myself doing something like this in my source code so that I could preview the JSON response. To preview my JSON, I would either scatter console.log all over my codebase and dig through the browser console window to find my JSON, or I would copy-paste the endpoint into Postman or a cURL request. 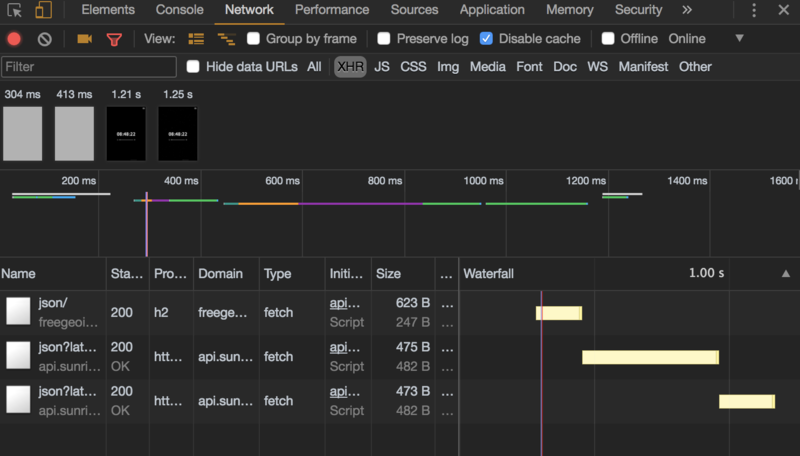 All of these work, but what if there was a faster way to debug JSON responses in the browser? 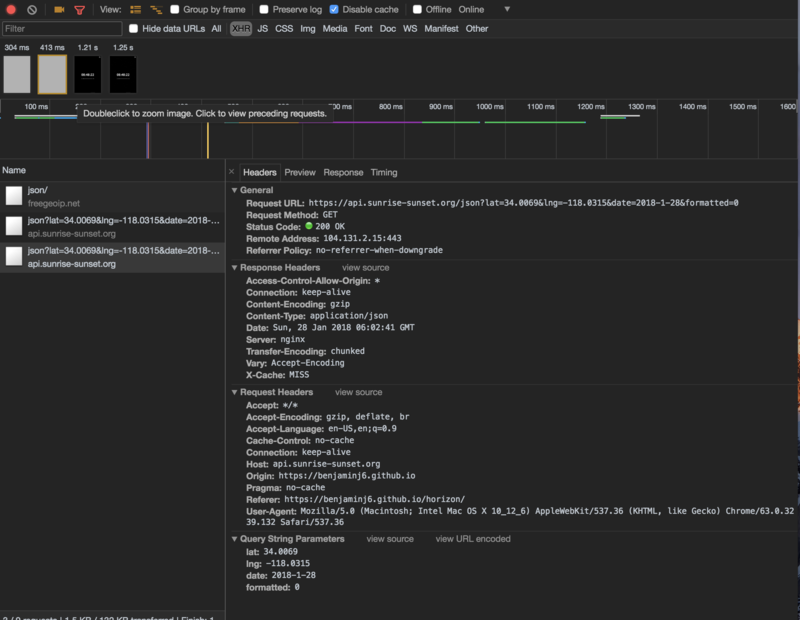 Chrome DevTools To the Rescue! Thanks to Chrome DevTools, we can preview our JSON without touching our source code (read: higher productivity & a smaller chance that you accidentally forget to delete a console.log). I’m going to demonstrate all of this on one of my own apps, called Horizon. It's essentially a sunset tracker, pulling data from https://sunrise-sunset.org/. You're welcome to follow along or use any app of your choice, provided it sends JSON over the internet. First, since we're gonna be debugging via the Network Tab, we'll want to open that up. Once you've got it open, you'll see something like this. Great! Now we're all set to start our debugging. While my sample app may not have a ton of requests, many apps can contain 100+ requests on initial page load, making it a little more difficult to find the specific AJAX request we're looking for. Fortunately, Chrome DevTools lets us filter by response type. You'll see all of the options available to you near the top bar. Select XHR (this stands for XmlHttpRequest), which contains all JSON data pulled into the app via fetch (or $.ajax, axios, or whatever way you're using to grab your data). That's really slick! Now we only have to parse through a few requests to find what we're looking for. Find the request that you're interested in. Click on the request and you should see a menu like this pop up. The final step is for us to select that Preview tab. Once selected, you should see something like this. As always, if you read this post and enjoyed it, I'd love to know! Shoot me a tweet on my Twitter or connect with me on LinkedIn.